The Host Country Agreement (HCA) was signed on August 7th 2016 by Md. 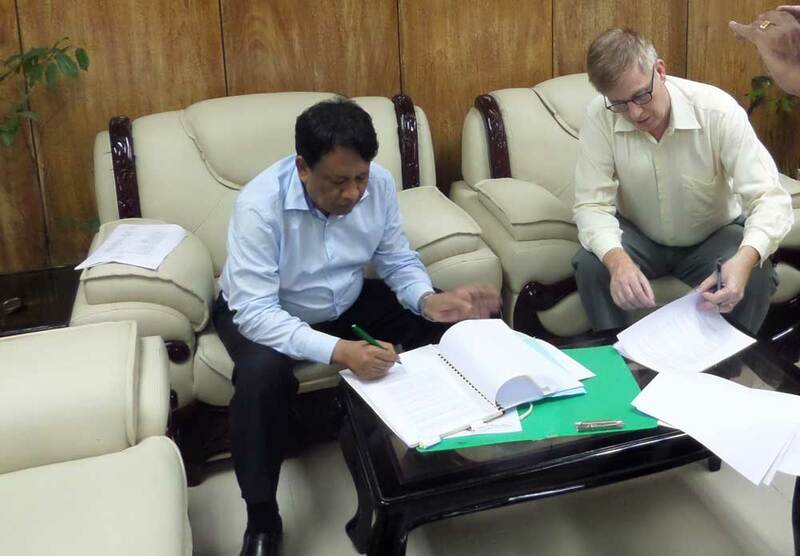 Shah Kamal, Secretary, Ministry of Disaster Management and Relief (MODMR) and Fred Witteveen, National Director, World Vision Bangladesh. Also in attendance during the signing were Mohammed Manirul Islam, Deputy Secretary, (Relief Admin), MODMR, Shabbir Ahmed, PS to Secretary, MODMR, Rakesh Katal, Chief of Party, Nobo Jatra, and Sabbir Hasan Chowdhury, Government Liaison and Monetization/Commodity Manager, Nobo Jatra. Along with the interim approval letter for call forward FY15 obtained in December 2015, the signing of the HCA is a major milestone for Nobo Jatra involving close coordination with a number of Ministries and their respective Departments. With the signing now completed, planned program activities have now accelerated with the FY16 call forward at the Ministry of Food awaiting approval and the monetization reimbursement process also initiated.